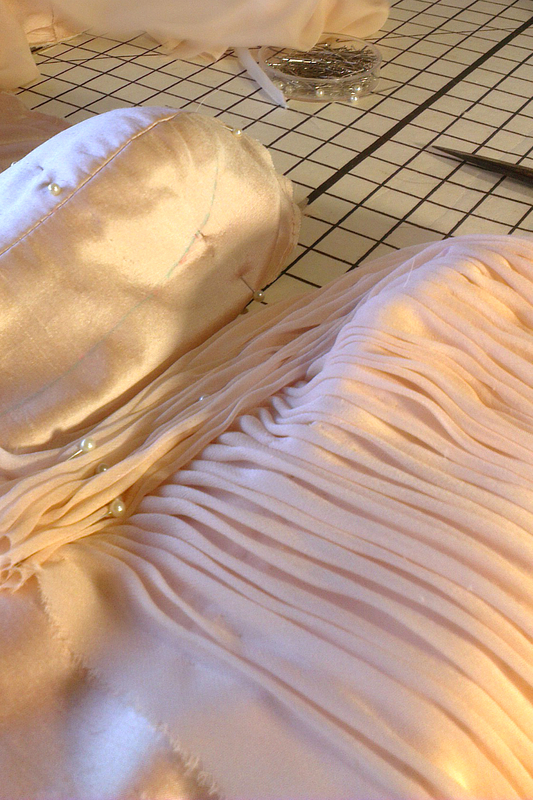 I recently custom-designed some blush silk gowns for the gorgeous Sabo Skirt girls. 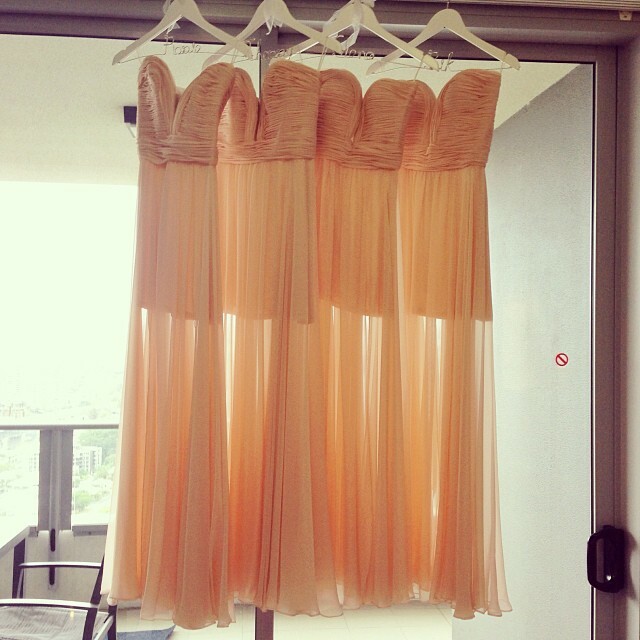 Yiota, blogger and co-owner of Sabo Skirt approached me to design some gowns for her four bridesmaids. I was excited at the opportunity as I love these girls’ style and their blog, so I was keen to create something amazing for them! 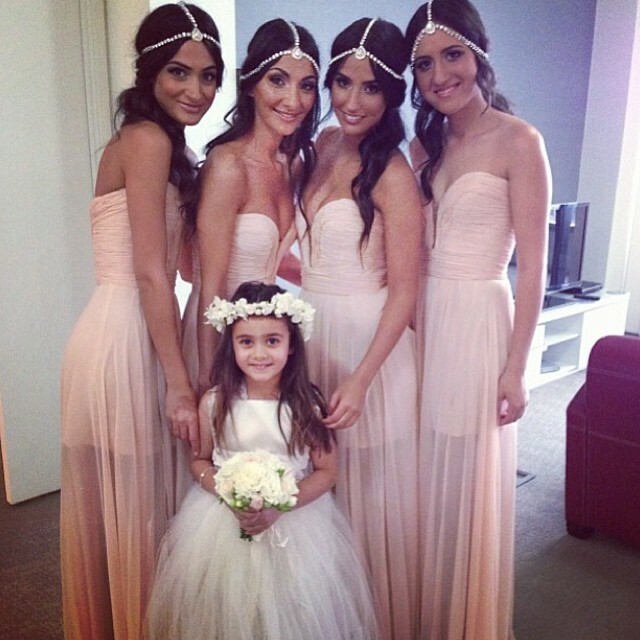 Yiota and her bridesmaids love the deep plunge design with curved french ruching at the bust. They wanted a dramatic look with an overlay of flowy sheer silk over a short, figure-hugging skirt. After consulting with the girls, I drew up a few designs and began working on a toille. 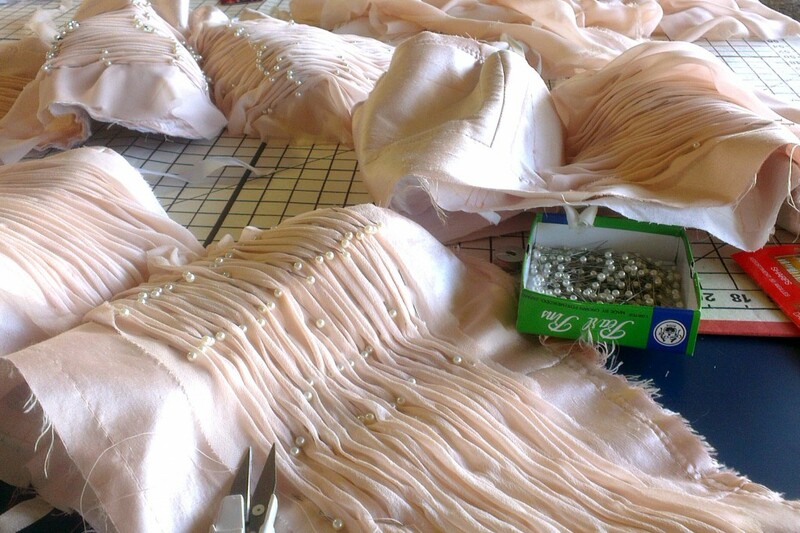 To ensure a wow-factor in the design, I decided to construct the gown with a built-in corset, a skill I learned from my mentor couturier, Kerry. The corset shrinks the waist by several centimeters, supports the bust area and creates the illusion of an hourglass shape. The most time was probably spent on the bodice of the gown, which featured French ruching for the front and back. This couture ruching process is purely done by hand and cannot not be rushed, otherwise it can look lumpy and unflattering on the body. After numerous fittings, I could not be more pleased with the outcome of these exquisite gowns. 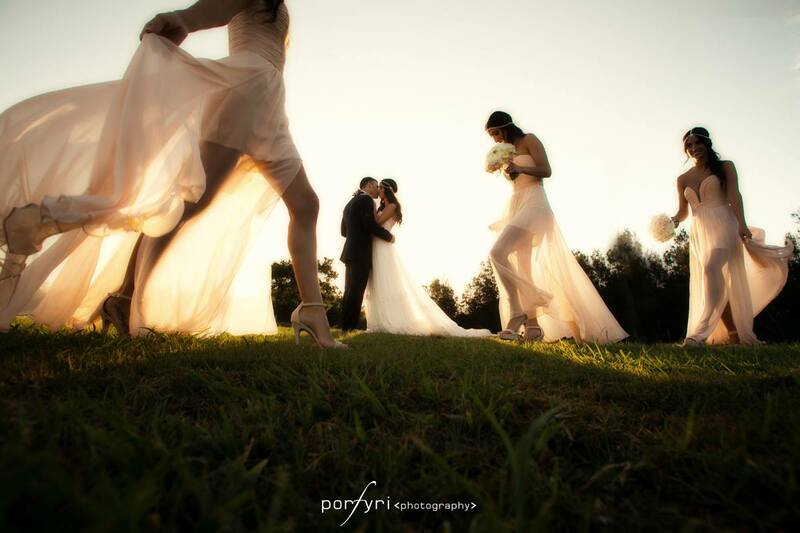 Yiota’s wedding pictures were absolutely beautiful, and the girls all looked amazing, like goddesses. These dresses were even featured in the latest edition of Cosmopolitan Bridal Magazine, Autumn 2014. 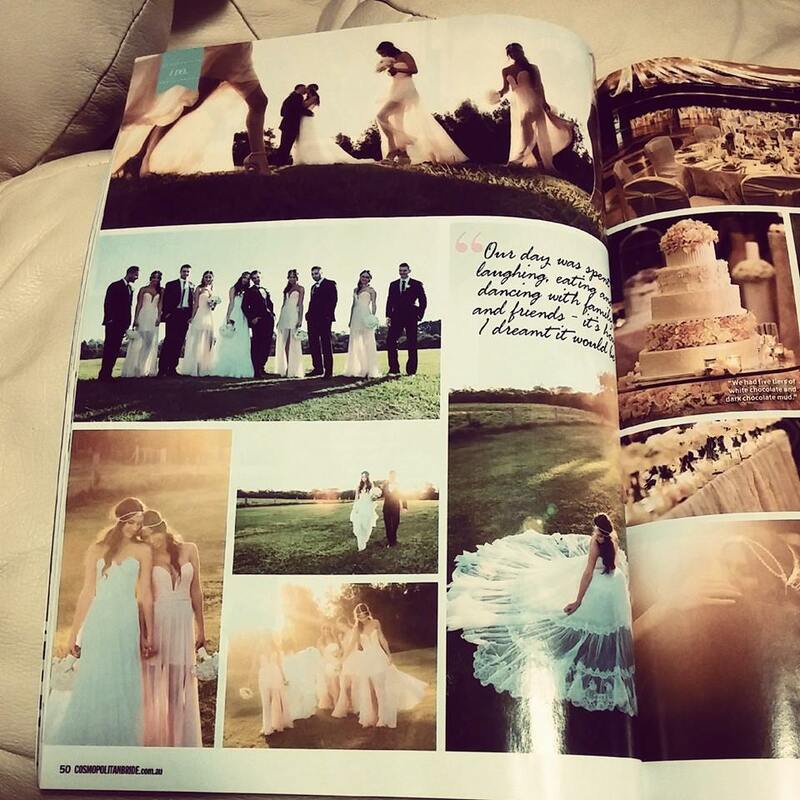 I have shared some work-in-progress pictures, some of Yiota’s photos from her wedding, and magazine clippings from Cosmo Bride. This entry was posted in Uncategorized and tagged Blush chiffon gown, Bridesmaids, Cosmopolitan Bride, couture, gown, Ruching, Sabo Skirt, Silk gowns, Yiota. Bookmark the permalink.